Cardi B and Offset apparently got married a while ago! 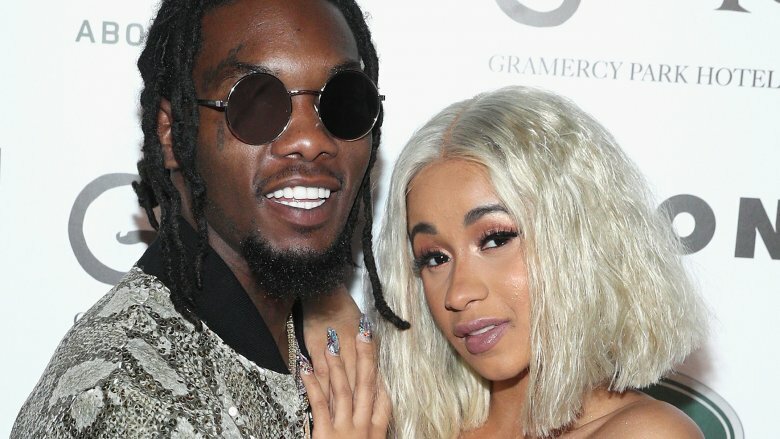 On Monday, June 25, 2018, TMZ reported that the celebrity couple obtained a marriage license in Fulton County, Ga. on Sept. 20, 2017 — a month before Offset publicly proposed to Cardi B at Power 99's Powerhouse concert. And the gossip rag had the marriage certificate to prove it. It didn't take long for Cardi B (real name Belcalis Almanzar) to address the matter via social media, confirming that she and Offset had indeed wed back in September. But she wasn't exactly thrilled that everyone now knows about her secret marriage. "There are so many moments that I share with the world and then there are moments that I want to keep for myself! Getting married was one of those moments! " she said in a statement posted on her Twitter account. "Our relationship was so new breaking up and making up and we had a lot of growing up to do but we was so in love we didn't want to lose each other, was one morning in September we woke up and decided to get married." Cardi B then described how she and Offset, whose real name is Kiari Cephus, found someone to marry them, and, with her cousin as her witness, the two wed. She shared, "I said I do, with no dress no make up and no ring!" The "Bodak Yellow" rapper explained that Offset had still wanted to give her a dream proposal, which is why he asked her to marry him a month after they had already tied the knot. "I appreciate and love my husband so much for still wanting for me [to] have that special moment that every girl dreams of when he got down on his knee and put a ring on my finger and he did that for me!!" she said. Cardi B then concluded her statement with some sass, saying, "Well now since you lil [nosy] f***s know at least ya can stop saying I had a baby out of wedlock." Guess the cat's officially out of the bag. Fans had previously suspected that Cardi B and Offset had secretly tied the knot after the Migos rapper had called Cardi B his "wife" while delivering an acceptance speech at the BET Awards on Sunday, June 24. Despite already being married, Cardi B and Offset may still be planning an elaborate wedding ceremony. "It's gonna be extravagant. You know, we're both rappers," Cardi B had said of her wedding in January 2018 (via People). "We're both artists, so it has to be a very extravagant wedding." No word yet on when that celebration will take place, but, given that Cardi B is very pregnant right now — and looks to be due any minute — we'd wager that the rap stars will throw their second wedding after their baby's birth.